So, is it too late to invest in Bitcoin, Ethereum or any other altcoins? The short and easy answer is no, but the reality is that it depends on a few things that only you can define. Your specific investment timeline is a huge factor. Can you afford to wait months or years, or do you need your capital back quickly? Also, know which specific currency to buy is key. There are some very strong leaders and some great up and comers we’re watching closely. Knowing the best time to buy is critical so that you minimize the downside risk and maximize the potential return. Chasing something after it’s gone up 100% in a couple of weeks is generally high risk. Over the long run, we expect that total market cap will continue to increase and will reach over $100 Billion. No one knows which cryptocurrencies will be leaders at the time but there some great use cases being developed that are point to a few high potential cryptocurrencies. Among some of the most viable today are Ethereum and Ripple. Does $100 Billion sound too far-fetched? 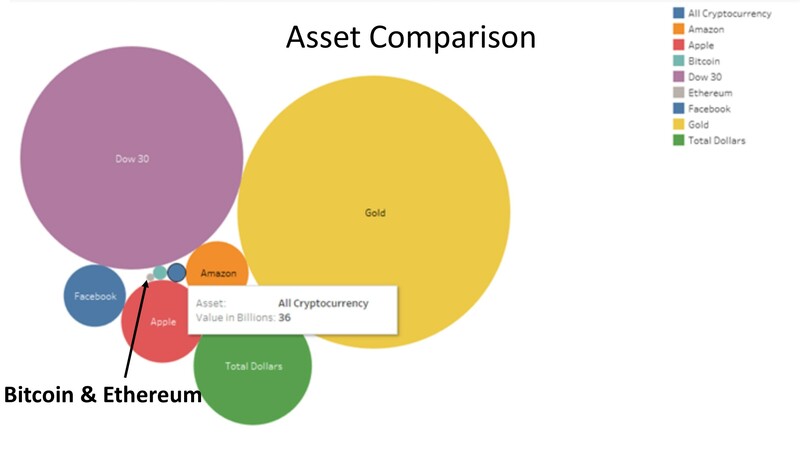 Let’s compare the total value of other asset classes for perspective. For simplicity sake, we’ll price everything in US Dollars. Gold – From Wikipedia: It has been estimated that all the gold mined by the end of 2011 totaled 171,300 tonnes. At a price of US$1,500 per troy ounce, reached on 12 April 2013, one tonne of gold has a value of approximately US$48.2 million. The total value of all gold ever mined would exceed US$8.2 trillion at that valuation. As of 2015, there were 2.5 Billion ounces of silver in identifiable above ground inventory. At current prices of $17.50, this is worth over $43 Billion. This does not include all of the gold and silver mining stocks, commodity exchanges and derivatives. In 9/30/2016, the combined market value of the companies’ part of the index was $5,476 billion. The S&P 500 stocks are worth 4 times as much. Let’s compare that to some of the top companies today. As of April 2017, these were the total values of these companies stocks. There was approximately $1.54 trillion in circulation as of April 5, 2017, of which $1.49 trillion was in Federal Reserve notes. That’s a big number when you consider how much actual cash is used this days, it only represents about 4% of all US dollar transactions in a year. 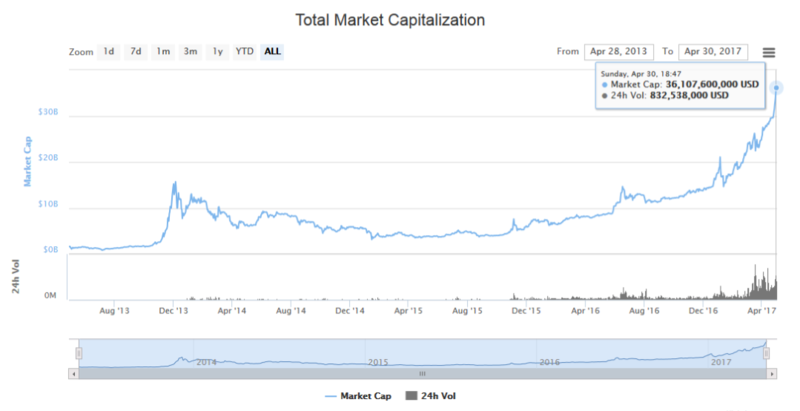 Total Cryptocurrency value as of April 2017 was over $36 Billion US. The leader is Bitcoin by far with a market cap of over $22 Billion and Ethereum coming in at #2 with a market cap of $7 Billion. So is it too late and if not, should you buy here? Watch this video for more in depth analysis. Stay tuned! Are Bitcoin and other Cryptocurrencies in a Bubble? Litecoin shoots past $20 – Up over 400% this year!